This small Belleek serving dish features an embellished handle and shamrocks. Sorry, this piece of Belleek dinnerware is now sold out. 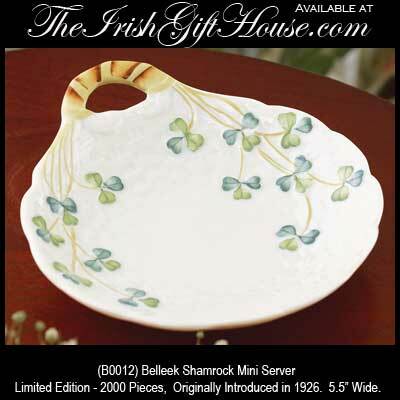 The Belleek shamrock mini server features hand painted green shamrocks is a limited edition of 2000 pieces; it was originally introduced in 1926. This 5.5” wide Belleek dish is hand crafted in Belleek, Ireland and is gift boxed with the shamrock history. Michael Maguire designed the Shamrock Tea Set in the late 1880s, and many new pieces were added in the ensuing years as its popularity grew. The Shamrock Trinket Dish, originally described as a butter dish in the 1928 Belleek catalogue, remained in production until 1990.